Hull City beat MK Dons to extend their unbeaten run in the Championship to eight matches and stay second. 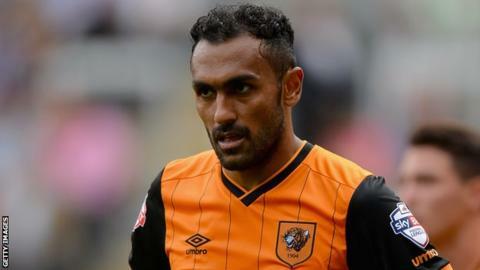 Ahmed Elmohamady scored midway through the first half when he slotted home Abel Hernandez's low cross at the back post after beating the offside trap. The Egyptian should have made it two when he took it around Dons goalkeeper David Martin but blazed over. MK Dons only had one shot on target, and Hull substitute Mohamed Diame's late strike sealed victory. Diame finished well in the 94th minute after he was played in by Shaun Maloney as the Tigers closed the gap on leaders Brighton to two points. MK Dons move up a place to 20th because of Bristol City's 4-0 defeat at home by Fulham, but Karl Robinson's side have only won one of their last 11 Championship matches. The match at Stadium MK, though, was bereft of much quality, with Hull keeper Allan McGregor only tested by Carl Baker's tame effort. Josh Murphy also curled wide in the first half for the hosts as they could not find their way past a side with the most clean sheets in the Championship this term. Hull, who knocked Leicester City out of the Capital One Cup in midweek, have now beaten MK Dons in all three of their competitive meetings. "We did not deserve to lose, one man has cost us, but I can't say his name. "The fans thought that was one of the worst officiating displays they've seen - but I can't say that. "When I got told that Jake Livermore wasn't interfering with play for their first goal I couldn't believe it. He's made a movement to the ball and the referee has got that wrong." "It was hard work. It was one of them dogged ones. All credit to the supporters who have made the effort to come down on a glorious day in a magnificent stadium. "It's never easy and we didn't play that well. However, we showed a certain resilience and a doggedness to make sure that we won the game. "My goalkeeper hasn't really made a save and there's one or two chances where we could have made it two, but fair play to MK Dons, they pass the ball around, they try and keep possession and it's not easy. "We've done enough to win comfortably without playing well." Match ends, MK Dons 0, Hull City 2. Second Half ends, MK Dons 0, Hull City 2. Offside, Hull City. David Meyler tries a through ball, but Mohamed Diamé is caught offside. Goal! MK Dons 0, Hull City 2. Mohamed Diamé (Hull City) right footed shot from the left side of the box to the centre of the goal. Assisted by Shaun Maloney. Daniel Powell (MK Dons) wins a free kick on the left wing. Attempt missed. Josh Murphy (MK Dons) left footed shot from outside the box is just a bit too high. Corner, MK Dons. Conceded by Sam Clucas. Attempt blocked. Daniel Powell (MK Dons) right footed shot from outside the box is blocked. Assisted by Samir Carruthers. Substitution, MK Dons. Samir Carruthers replaces Darren Potter. Substitution, Hull City. Shaun Maloney replaces Abel Hernández. Delay in match David Meyler (Hull City) because of an injury. Attempt missed. Antony Kay (MK Dons) header from a difficult angle on the right is just a bit too high. Assisted by Carl Baker with a cross following a corner. Corner, MK Dons. Conceded by Alex Bruce. Offside, Hull City. Mohamed Diamé tries a through ball, but Sam Clucas is caught offside. Offside, MK Dons. Kyle McFadzean tries a through ball, but Nicky Maynard is caught offside. Substitution, Hull City. Mohamed Diamé replaces Chuba Akpom. David Meyler (Hull City) is shown the yellow card for a bad foul. Carl Baker (MK Dons) wins a free kick on the left wing. Substitution, MK Dons. Nicky Maynard replaces Simon Church. Corner, Hull City. Conceded by Antony Kay. Darren Potter (MK Dons) wins a free kick in the defensive half. Attempt blocked. Jake Livermore (Hull City) right footed shot from outside the box is blocked. Assisted by David Meyler. Hand ball by Jake Livermore (Hull City). Attempt saved. Abel Hernández (Hull City) left footed shot from outside the box is saved in the bottom left corner. Assisted by Chuba Akpom.